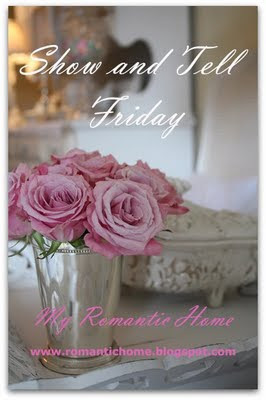 Cindy hosts Show & Tell Fridays over at her fabulous blog My Romantic Home every Friday. Today, I decided to participate and wanted to share my vintage valentines. My mother gave these to me about 5 years ago. I can remember them from when I was a kid. She would take them out every year and I would look at them over and over again. I've always loved them. I wish I was able to pinpoint how old they actually are. (Without revealing my ancient-ness, ahem, I know they're at least 30+ years old!) 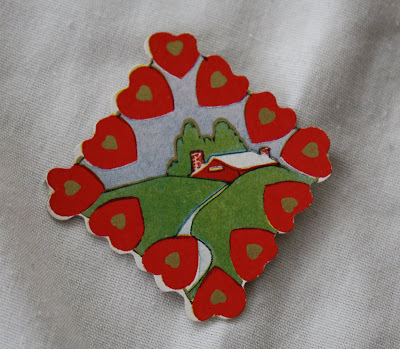 This is one of my absolute favorites: I think it's so cute with the heart border and the farmhouse nestled sweetly into the hills. If you get a chance, head on over to My Romatic Home and see what the others are sharing today. Have a great weekend! love them! i love vintage valentines, you have an amazing collection of them. Great collection - thanks for sharing with us. LOVE the vintage valentines and how much MORE special they are since you've had then for so long. PS: Like you previous post about the pink side table. My neighbor has a similar one (but only two drawers) in her greenhouse. It's PINK too! I'll have to blog about it. Yours came out great! 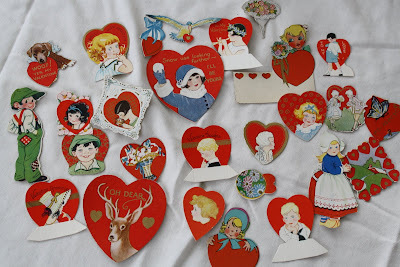 Wonderful vintage Valentine's Day cards...How awesome that your mom would so lovingly keep them to give later to you. I think my favorite is the one with the little black-haired girl with the blue ribbon in her hair...right next to the little boy with green overalls...too cute. Just wanted to ask how you were doing. How is your eating healthier plan going? Still on track? You know I'm cheering for you:-) Rah! Rah!